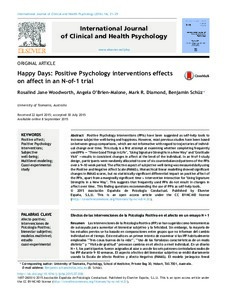 Positive Psychology Interventions (PPIs) have been suggested as self-help tools to increase subjective well-being and happiness. However, most previous studies have been based on between-group comparisons, which are not informative with regard to trajectories of individual change over time. This study is a first attempt at examining whether completing frequently used PPIs - ‘Three Good Things in Life’, ‘Using Signature Strengths in a New Way’ and ‘Gratitude Visit’ - results in consistent changes in affect at the level of the individual. In an N-of-1-study design, participants were randomly allocated to one of six counterbalanced patterns of the PPIs over a 9–10 week period. The affective aspect of subjective well-being was measured daily using the Positive and Negative Affect Scale (PANAS). Hierarchical linear modelling showed significant changes in PANAS scores, but no statistically significant differential impact on positive affect of the PPIs, apart from a marginally significant time × intervention interaction for ‘Using Signature Strengths in a New Way’. This suggests that frequently used PPIs do not result in changes in affect over time. This finding questions recommending the use of PPIs as self-help tools.